When first getting into wine, we often get hung up on wine ratings. Whenever you walk into a wine shop you see signs over every other wine saying "98 points Wine Spectator!" or "91 Points Robert Parker!". Every wine critic and wine related magazine comes out with a slew of wine ratings every year and even list their 100 best wines of the year or "A Hundred Wines Rated 90-Points or Greater!" It can be a bit overwhelming and the new wine enthusiast can feel that wine is all about points. You don't know how many times we've overheard conversations at wine tastings or in wine shops where people ask "how many points did it get?" or "did Parker like it?" The fact of the matter is, wine is a subjective thing. Not everyone is going to agree on what is a great, or even good, wine. Tastes and preferences vary so much. Also, wine is a living thing that changes from day to day and bottle to bottle. While you may enjoy a bottle of a wine tomorrow, the same wine in 2 months may be going through a strange phase that doesn't show as well. To put an exact number on the quality of a wine seems kinda silly to us in fact. In fact, if you look at examples of our own wine tasting notes, we don't even use numbers, or stars or any other wine ratings type thing to indicate how much we like a wine. We feel the description of a wine and what you liked or didn't like about it is far more important than the number. So we have to start off this page by saying, try not to get hung up too much on numbers. What 92 points means to one person may mean something completely different to another. And just because Robert Parker or some other critic likes something, doesn't mean you have to. We have enjoyed dozens of wines that he or others have panned and hated others that critics raved about. Try to follow your own taste and preferences to find what is right for you. Who Are the Critics Out There? This is not a complete list, just an overview of some of the most important wine critics out there currently. Robert Parker: Robert Parker, creator and head of the Wine Advocate, is arguably the most qinfluential wine reviewers of all time. 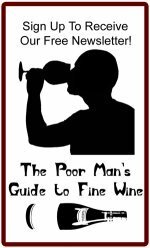 While he originally did all the wine reviews and wine ratings for the Wine Advocate, he now employs several other critics who work for the Advocate and cover specific wine regions he doesn't have time to cover anymore. His particular area of interest is Bordeaux, California and the Rhone Valley. As is true of any influential person, Parker has people who love him and hate him. His taste is generally for full-bodied, powerful wines with huge extract and depth of fruit. For that reason, many of the wines he rates highest are these styles of wine. This is a generalization but it seems to be true more often then not. We don't always tend to agree with his preferences but many people do. He rates all wines on a 100-point scale (see below). Wine Spectator: The Spectator is a large wine magazine that both has articles about food and wine as well as wine ratings. Like the Wine Advocate today, the Spectator doesn't have any one critic who does everything. Instead, it employs several different writers who have particular areas of interest. James Suckling, James Laube, Harvey Steiman are just a few. Wines are also rated on a 100-point scale. Steven Tanzer: Tanzer runs the International Wine Cellar which covers wine from around the world. Also scoring wine on a 100-point scale, Tanzer covers most regions himself. Allen Meadows (AKA Burghound): As his name implies, Allen Meadows' main focus is Burgundy. His newsletter, called Burghound, is a quarterly publication of everything Burgundy. He also covers California Pinot Noir and Champagne occasionally. He uses a 100-point scoring system for wine ratings but tends to be a tougher rater, scoring many excellent wines that he likes in the 80's. The 90's are reserved for extra-special wines that he loves. What Are the Different Wine Ratings or Scoring Types and What Do They Mean? 96-100 Points: An extraordinary wine of profound and complex character displaying all the attributes expected of a classic wine of its variety. Wines of this caliber are worth a special effort to find, purchase, and consume. 90-95: An outstanding wine of exceptional complexity and character. In short, these are terrific wines. 70-79: An average wine with little distinction except that it is soundly made. In essence, a straightforward, innocuous wine. 60-69: A below average wine containing noticeable deficiencies, such as excessive acidity and/or tannin, an absence of flavor, or possibly dirty aromas or flavors. 50-59: A wine deemed to be unacceptable. 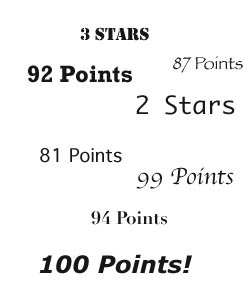 Other Scoring Scales: Other wine ratings systems use scales such as the 20-point scale and the 3 stars scale. These different scoring systems and others are employed by various critics around the world and mean different things to different people. Refer to the individual critics publications for an explanation of the rating system. Who's Wine Ratings Should You Trust? This brings us back to what we were talking about above. 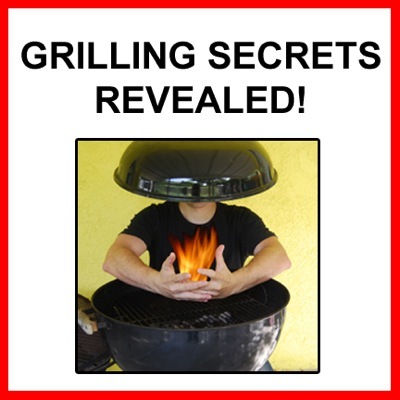 These is no one person's taste and preferences you should trust absolutely except your own! No one critic is absolutely right and no one critic will share your tastes 100 percent. As you compare them, you may find that you agree more often than not with some critics more than others. You can use this information to focus your reading and decide whose wine ratings to pay attention to the most. However, as we stressed above, if you are truly interested in learning about wine and exploring it in depth, don't limit yourself by only following ratings. There are hundreds or thousands of great wines out there that you may never find a rating for! Also, there are truly great wines that you can find mediocre or bad scores for. Follow your nose and mouth and build your experience with wines so that you can best judge what is a great wine, for you. This way you won't potentially miss a truly pleasurable wine just because some critic says it only gets 82 points. Try to avoid being a points hunter, it is not becoming of a true wine lover. Done learning about Wine Ratings? Return to the Wine 101 page.